The former Roadhouse Grill off Clairmont Rd. is going Greek. 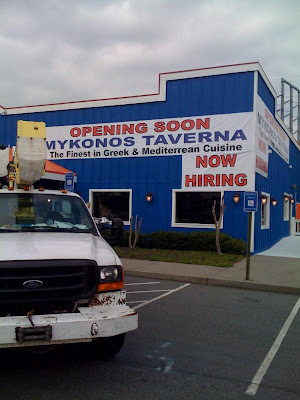 Mykonos Taverna is scheduled to open late April in the former restaurant space and will double as a nightclub late at night. With an eye-catching new paint job, the interior was completely transformed now with marble walls and multi surface flooring. The restaurant will have a full bar, dance floor and outdoor dining. The restaurant may sound familiar to some as a sister restaurant opened earlier this year in Marietta on Cobb Parkway. With a large Greek neighborhood a stones throw from the restaurant, the restaurant is sure to have a built in clientele aside from anyone wanting a tasty gyro. Repeat Atlanta! Looks like a flea market from the outside. I wonder how it will compare to the likes of Buckhead life group's Kyma? Anyone know if it has opened yet? Can't find a phone number to call.